Congressman Ron Paul, R-Texas, greets fans after speaking to approximately 300 supporters during a campaign rally at Paris. Paul's Credentials: Ron Paul, a U.S. congressman who represents Texas' 14th District, is mounting a presidential campaign buoyed largely by non-traditional support via the Internet's social networking sites, blogs and YouTube.com. His Internet-savvy supporters are helping to gain Paul more grassroots visibility than he would have otherwise have received from traditional media outlets. 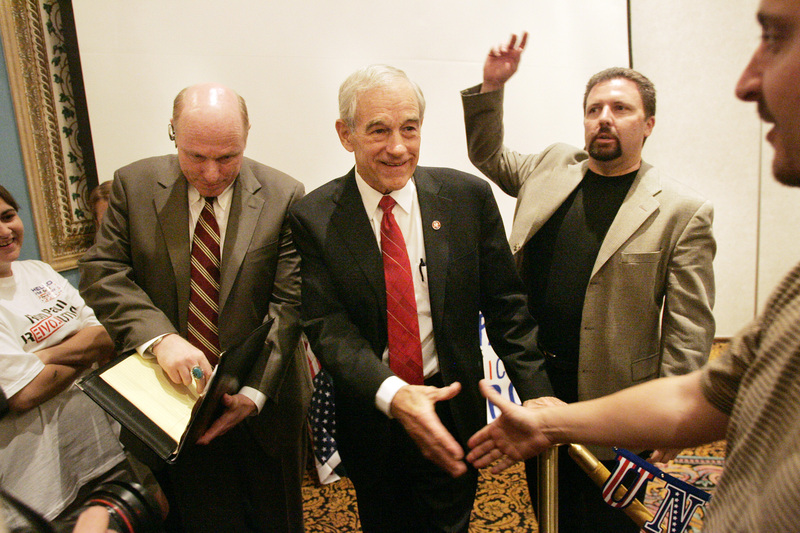 Paul, a physician who was the 1988 Libertarian candidate for president, is a conservative Republican who believes in limited constitutional government and whose libertarian and anti-war views have gained him a diverse base, from gun owners to pro-lifers to college students. He formally announced he would run for the GOP nomination on March 12, 2007, on CSPAN's Washington Journal. Date of Birth: Aug. 20, 1935. Place of Birth: Greentree, Penn. Children: Ronald "Ronnie" Paul, Lori Paul, Rand Paul, Robert Paul, Joy Paul and 17 grandchildren. Experience: Republican nominee for U.S. House of Representatives, 1974; U.S. Senate, Republican candidate, 1984; U.S. House of Representatives, Texas District 22, 1976-1977, 1979-1985; Libertarian presidential candidate 1988, U.S. House of Representatives, Texas District 14, 1996-present; chairman of The Liberty Caucus of Fellow Congressman. Notables: Republican contender Paul has been called the Internet candidate and although he is running for nomination on the Republican ticket, he is still has a strong Libertarian base. Paul and his wife, Carol, first met when she asked him to accompany her to a Sadie's Hawkins dance. Paul proposed to her at a park over a picnic lunch in 1956. A doctor specializing in obstetrics and gynecology, Paul has delivered 4,000-plus babies. Paul on the Issues: A look at where Paul stands on the issues and how he has voted. Nevada Contributions: A breakdown of Paul's financial contributions from the Silver State. State by State Contributions: A breakdown of Paul's financial conributions across the U.S.
Paul's MySpace page: Read Paul's profile information and leave a message. Paul's Facebook page: Read Paul's profile information and leave a message. Paul's Flickr page: View photos of Paul from the campaign trail. Paul's YouTube Videos: View Paul's latest political videos. Campaign Manager: Lew Moore and more key people.